So I teased you in my last post about ‘Coming to America’. Its all part of my bubbling excitement because the fartherest west I’ve been is Barbados – I know, its not a bad bookend. Now, I am glad, just like Eddie Murphy was in his film version ‘Coming to America’. Its not as though I haven’t wanted to visit, its just that somehow, it hasn’t been the right time and now, all of a sudden it is. And no, we’re not moving, I’m presenting some of my work at a conference in Houston and I’ll be back in the Netherlands in a week. A short time to fly across the world but long enough for many dreams to come true. Walmart. Target. Wholefoods. Shopping malls. 7 lane highways. Sunshine and warmth. William Sonoma. TJ Maxx. Bath & Bodyworks. Children’s Place. Gap…even…..maybe. Who knows? And all of this in the 2 and a half days there is to shop before the conference. Rejoice and celebrate with me my friends, my horizons are expanding, my mind afloat. 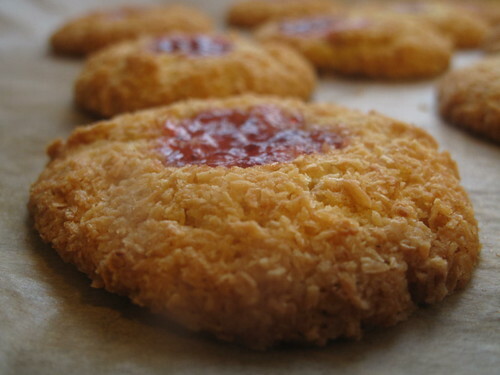 And to compensate, I’m travelling back in time with some of my childhood favourites, coconut jam drops. When we were growing up, my mum would order cookies from a friend of hers. When the bags of crisp coconutty goodies would arrive, they would be bagged in small portions, sealed to deny greedy hands access till the timing was right. With the patience of children who have peeked at Christmas gifts on the eve of the momentous day, we would wait, questioning, hounding, begging and being on best behavior till she relented and let us have some. My sisters and I would dash off, bag in hand, and proceed to chomp our way through crisp yet crumbly, sweet yet not sugary cookies. 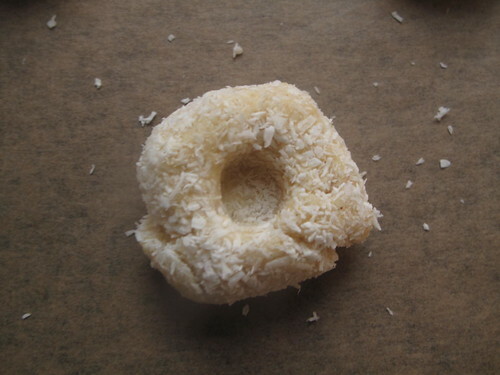 The shredded coconut wasn’t fine, rather coarse, held together with flour but yet extremely coconutty, and at the centre there would be jam. 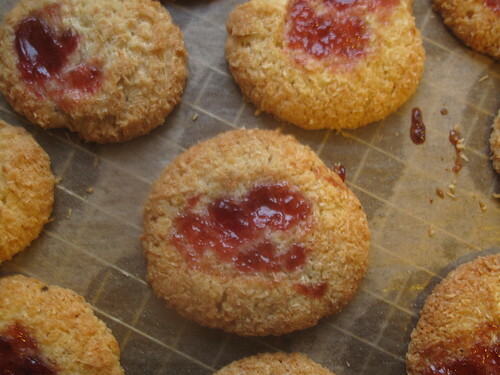 Delicious strawberry jam that had changed character and turned to jelly. 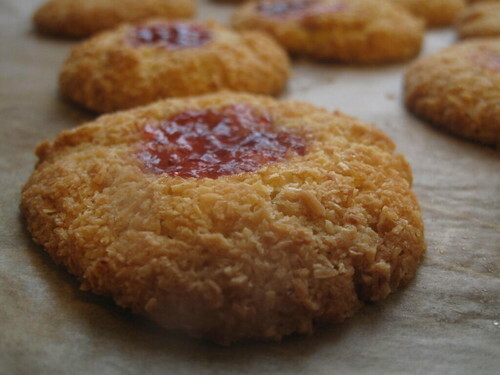 Those were the best every coconut jam drops. 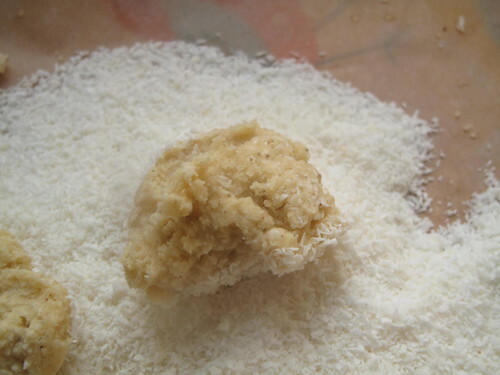 So this week, when my daughters had to bring ‘treats’ to school in celebration of International day, I thought of making coconut candy – a popular Nigerian snack of caramelized grated coconut. 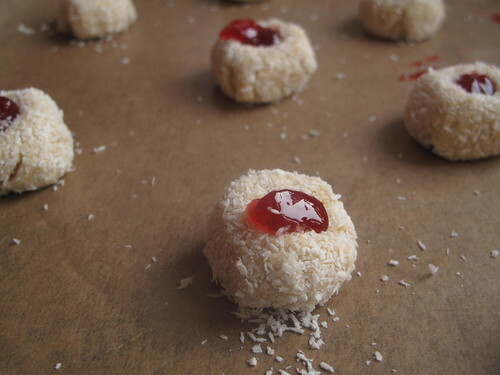 When I realized I wouldn’t be able to make it to the shops to get a bag of freshly grated kokos, my mind went on a long walk and came back with coconut jam drops. A short jaunt to Australia and a recipe was in hand. And not a bad one for recreating childhood recipes. 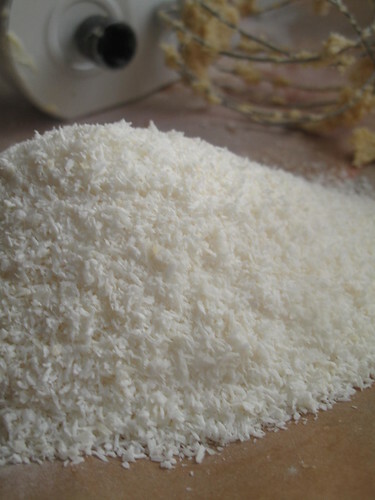 Still some tweaking to be had – less eggs, more coconut, preferably fresh, coarsely grated flakes, which are then baked in the oven before being incorporated in the dough. But overall, very nice. 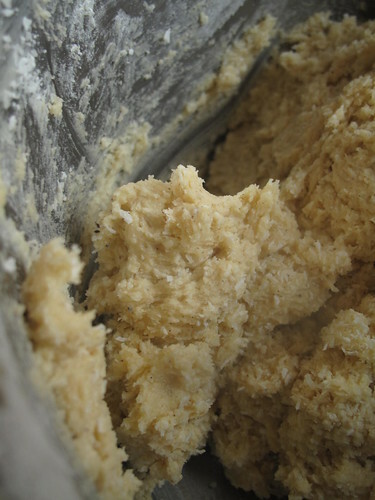 Beat butter and sugar with an electric mixer until pale and creamy, add egg and vanilla extract and beat until light and fluffy, turn speed to low and add sifted flour, baking powder and 1/2 cup coconut, beat until just combined into a soft dough. 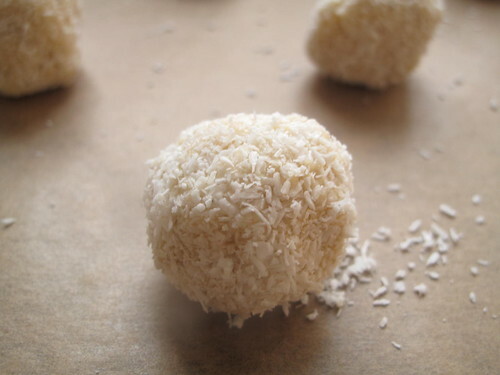 Drop teaspoonfuls of biscuit mixture into extra coconut and roll to coat, remove and roll into balls. 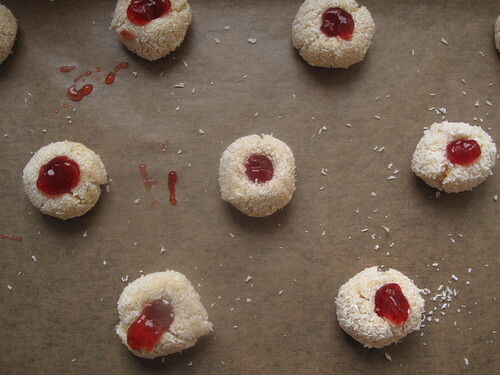 Arrange balls on a baking paper lined tray allowing 5cm for spreading between each biscuit. Take the back of a wooden spoon and make a dent in the top of each ball. Bake biscuits at 170°C for 15 minutes until pale golden. Remove and cool on tray for 5 minutes before removing to a wire rack to cool completely. Meyer lemons, I’ve heard too much about Meyer lemons to not even give them a try! High-heeled shoes for my 7 year old, she moans’ I’m the only girl in my c lass who doesn’t have high heeels’. Peer pressure. And when I say heels, these are 1cm , ok maybe 2 or 3 cm thick wedges, not pointy ones. Oh, the fashion sense of Grade 2ers. Then I take her to school and ask the other girls, it turns out they were not being exactly truthful….but by then of course, she’s made up her mind. She’s having heels. I already have vanilla pods, numerous cooking books, a nice wilton 3 tier baking pan and ateco food gels as well as Ziplocs waiting for me at my friends. Remember when I won the food52 contest back in July with my suya recipe, well I received a box of goodies from OXO – patiently waiting for me in Houston and a $100 gift card from Wholefoods to spend in the US or Canada so I have a kickstart with my pocket money. Any other things I should add to the list, along with things to sample – Tex Mex, Steaks etc? Please let me know.